Classroom management is always a hot topic because it's so crucial to a successful (and sane) school year. Whether you are looking at this because you are a new teacher or a seasoned one, I'm sure you'll agree that Classroom Management is #1 on the list. That's why this new bundle should address many of your needs as a classroom teacher. 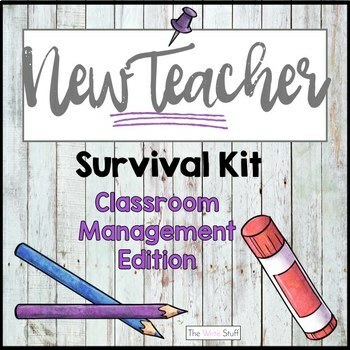 I have collated my BEST resources that I think will help you, as a new teacher or a seasoned teacher needing some new ideas, with classroom management. A unit on mindfulness to help students learn self awareness. Self awareness leads to awareness of others and the world around you. This is a great set to help students learn to get along and be more mindful of the people in their lives. Otherwise known in my classroom as The Self Regulation Station. This set has all the printables you need to set up your own station with a science fair 3-faced board or on a bulletin board. Students can check in in the morning and throughout the day identifying how they are feeling. Cool Cats are ready to learn! There is also a set of Classroom Rules for Good Citizenship. Here, not only do students learn from the poster set they also WORK with the rules using printables that are supplied. Sometimes no matter what you do, there is that child that doesn't respond. Their motivation for misbehaving is often hard to identify not to mention work with. For this reason, I created Behavior Management Tools to help teachers identify the behavior motivation and provide some simple tools for you (and the student) to help understand and deal with the behaviors in order to become a successful learner. Take a look at the previews that are available on each page with a full description of each product if you click on the links.